Fall is kicking off in southern Ontario as signalled by the increasingly cool evenings and fall colors starting to dot the trees. Soon the dull glimpses of orange and red dotting the treescape will burst into an full explosion of fall colour. This is the time to be outdoors. 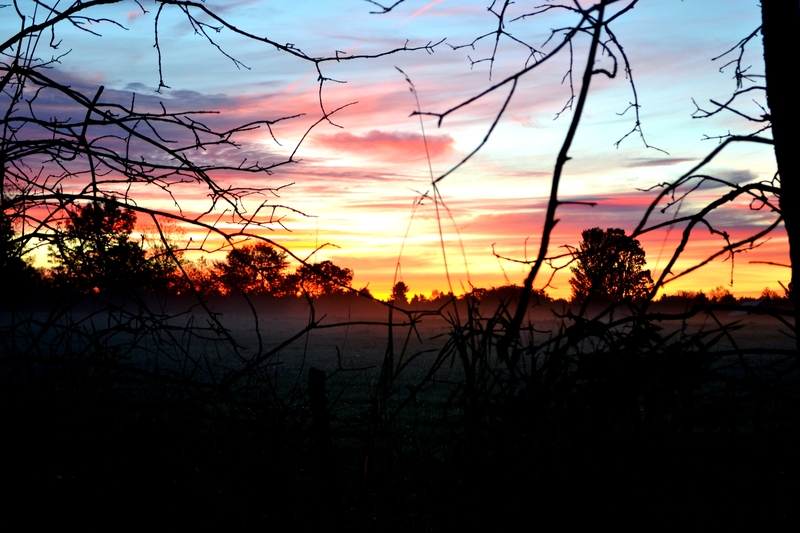 Weather your a waterfowler, upland game hunter, hiker, photographer or a fishing enthusiast, everything comes to a head in the fall. I woke up this morning with hopes of capitalizing on the fall action both for geese and fishing. Although the geese were a bit sparse for any real success, the fishing sure was hot. My friend Dave picked me up at 5:30 on Sunday Morning with his canoe atop his car and gear all set. After loading both hunting and fishing kits into his ride we were off speeding north towards a beauty of a day. We arrived at a small lake north of Verona about an hour or so later and packed our gear in the canoe. After five minutes on the water I realize I left my DSLR back in the car. This is what happens when I get excited about hunting and fishing. First up, we spent about 30 minutes in one of my goose spots waiting for some birds. Unfortunately all we saw were solos and doubles and they were way to far out for the 870. Ah well, its only the tail end of the early week in our zone and goose season doesn’t really start to heat up until the end of September anyways. On to bigger and better things! We abandoned the goose hopes and decided instead to focus on the fishing. After all, it was the begginnings of fall and that’s when the giant bass come out to play. Fishing started off in a big way with what I believe to be a monster walleye that hit my jig coming off a rocky shore line. 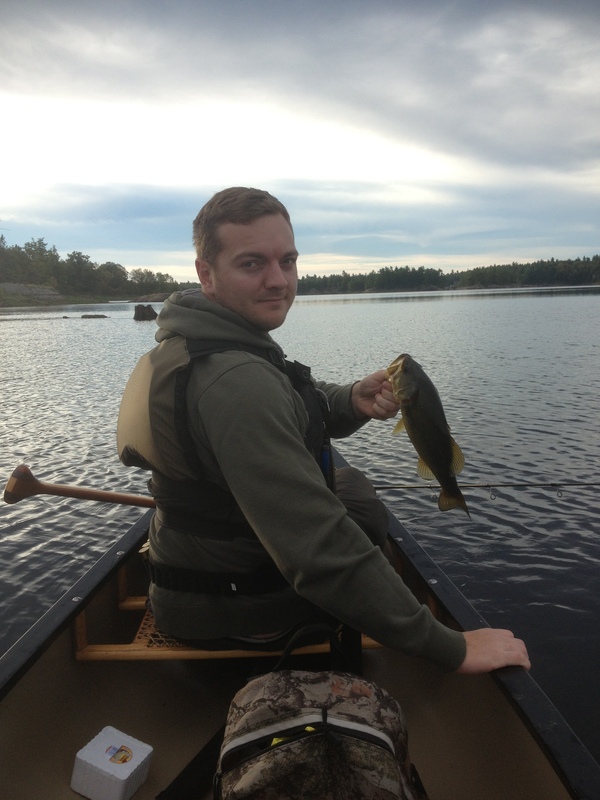 The big guy did the typical “im to tired to fight” walleye dance and got off right by the canoe. 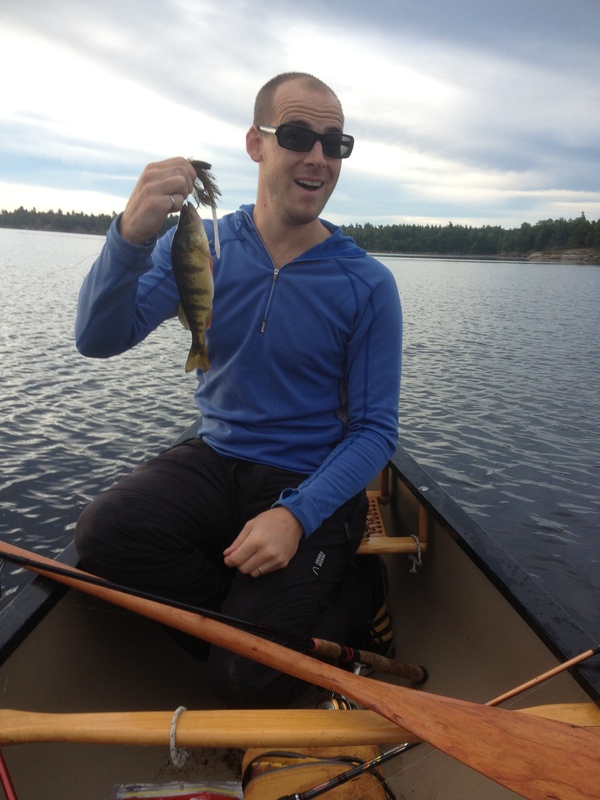 Although this was a big disappointment, soon after my friend caught this jumbo perch which was a welcome addition to the boat. No quite the consolation prize I was hoping for but it will work for taking the skunk off. Following the meager catch, we proceeded to catch a few bass along some weededges near deep water (this is a key tactic for fall bass). For a change of pace we decided to hit up some deeper areas near some rock faces along a lake channel that connected two of the lakes larger areas. 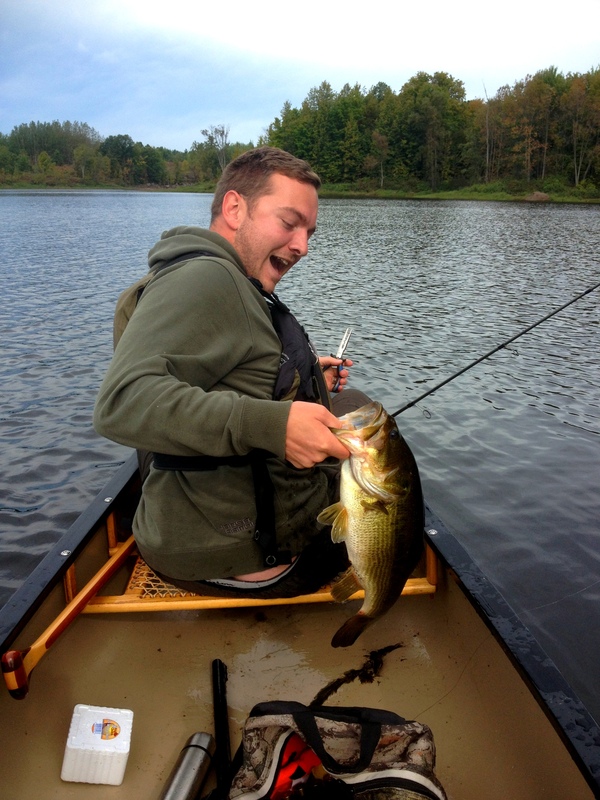 This turned out to be a great idea as Dave hooked and lost a pretty massive largemouth. Almost immediately after, he hooked into another rod bender. This one was hooked pretty well and wasn’t going anywhere. Energized and excited by the prospect of a giant bornzeback Dave fought the fish for quite a long while. I was pretty amazed by the patience Dave showed as he gingerly fought the fish and took his time bringing in the beast. 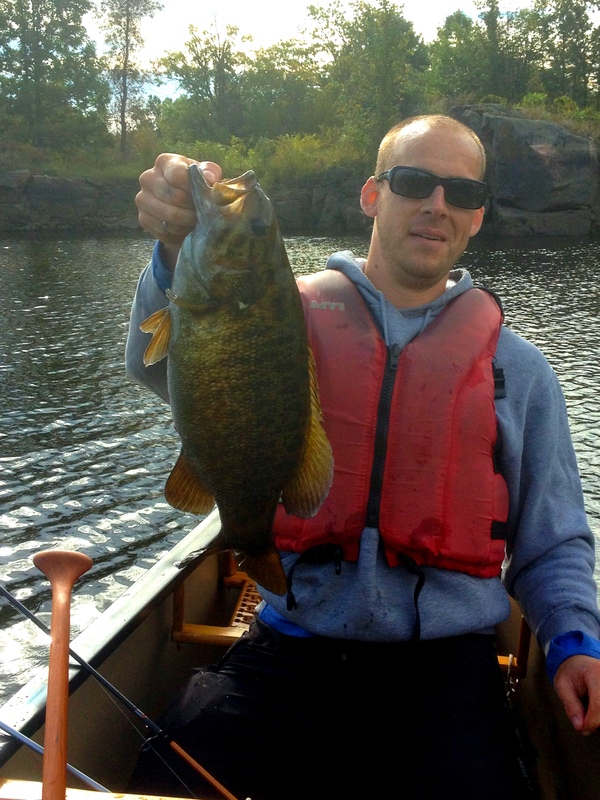 These are all skills required to bring in larger fish when fishing from a canoe and these traits are especially important when the large fish is a 6+ lb smallmouth and your new personal best! Congrats Dave, that is one hefty looking smally. The adrenaline kept us pushing forward, optimistic for another big fish. As luck would have it, it was my turn to tangle with a southern Ontario giant of the largemouth variety. The fish hit on a soft wacky rigged worm just near the edge of a weedbed facing the open lake. At first the hit seemed light and I reeled in to clear the small fish from my line. The minute the fish spotted the boat the game changed and my drag was singing the sweet tune only a fat lunker makes. This fish lived up to the hype the reel was forcasting and was estimated at 5.5 lbs (Scales are a luxury when your paddling in a canoe with goose gear and wo sets of fishing gear). This fish was definitely my biggest largemouth of the season. Fish were caught using a variety of methods including wacky worms, spinner baits, jigs and texas rigged swim baits. 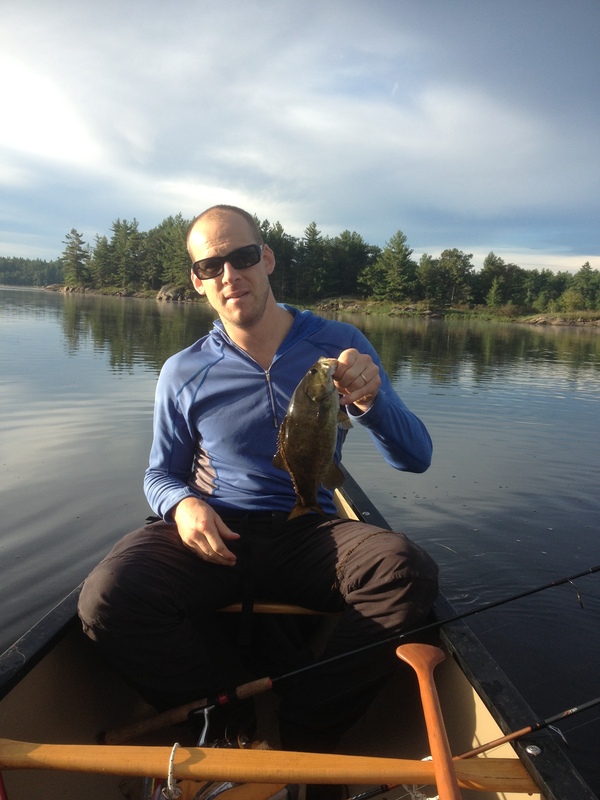 All fish seemed to be caught on deep weededges or rock faces near channels or big water. 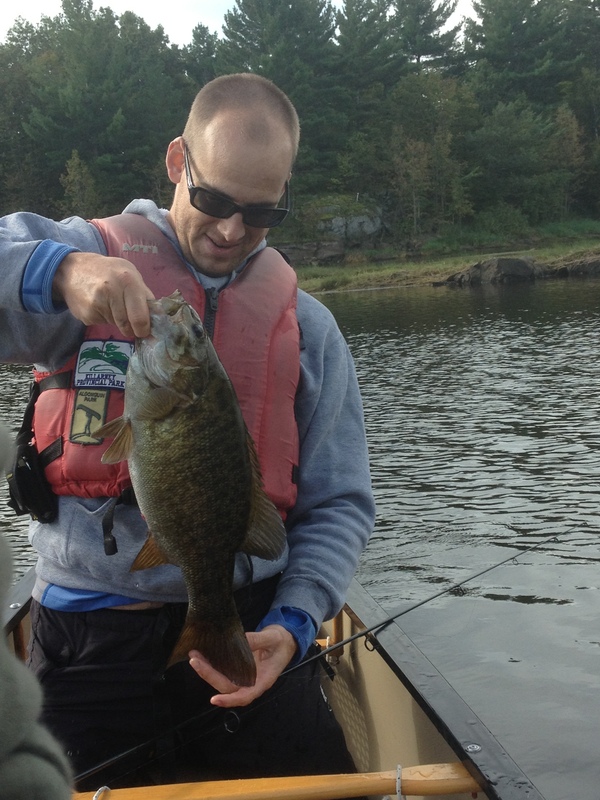 In my experience, Bass start to put on the feedbag in the fall in a big way. Although they move out of their summer shallow water haunts for deeper waters, they still stay proximal to weededges and the like. 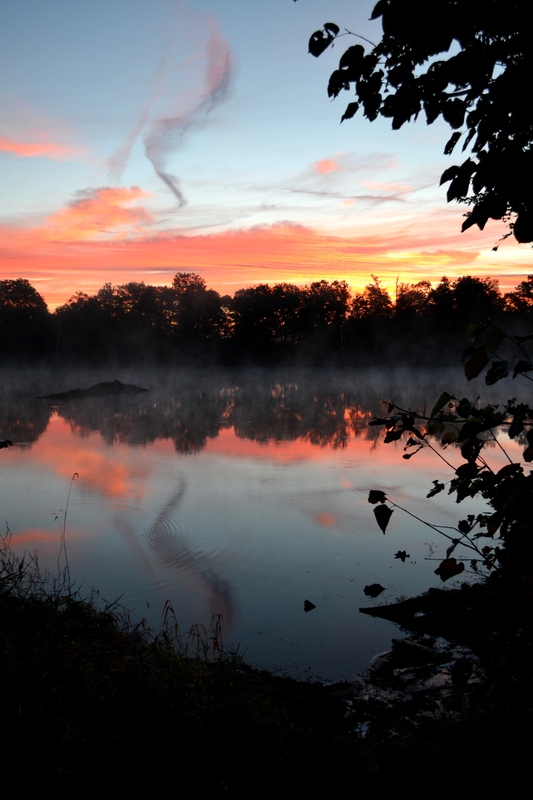 Look for drop offs with submerged weeds or weed edges near the larger portion of the lake. Bass will often hangout near these edges popping up into the shallows when food is around. One more piece of advice, don’t be intimidated by slower action either and try to have a little patience. You may not have a 30 fish day, but your bound to tangle with the larger fish in the lake. 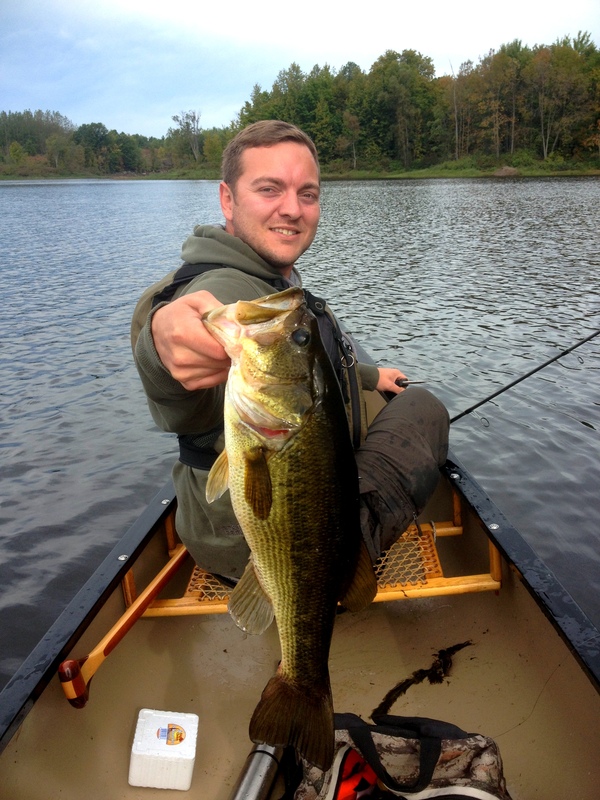 This entry was posted in Fishing, Hunting and tagged bronzeback, Crown land, fall feedbag bass, Fishing, get outdoors, Get Outside, giant smallmouth, goose hunting, Largemouth bass, Ontario, smallmouth bass, the wilds of ontario, Verona Ontario. Bookmark the permalink.